Cavitation, the process of vaporization, bubble generation and bubble implosion in a flowing liquid is used as the underlying process within the Cavitation Engine. The cavitation engine uses mechanical energy to convert water to steam via the process of cavitation and subsequent bubble collapse. Conventional automotive fuel injectors are used to accelerate water saturated with cavitation nano-bubbles at a specially designed impact target. Modern diesel injectors are designed to enhance cavitation in the fuel being injected into combustion chambers. In the case of the cavitation engine, water is used instead of diesel fuel. During the collision enormous hydraulic pressures collapse the bubbles within the injection volume. 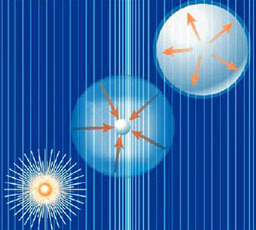 Cavitation bubbles have the remarkable ability to focus intense energy and forces during their collapse. The resulting heat energy contributes to the continuous creation of superheat steam within the impact and expansion chambers. Many explanations have been put forward to account for the increase in heat within the impact chamber apparatus during operation at low impact rates (1 - 5 impacts/second). Operation of the system at pressures of 20000 - 25000 psi, assuming injection velocities ranging from 1000 m/s (meters per second) - 1500 m/s and nothing other than kinetic energy, cannot account for the heating that ensues. The production of oxy-hydrogen and the observed explosions as well as the systemic increase in temperature in the absence of additional heating are inconsistent with the thermodynamics and physics of the system whereby the heating is described only in terms of the hydraulic energy input and some initial heating of the impact chamber. Initially we assumed that the oxy-hydrogen generation was caused by electrolysis associated with the high temperatures and pressures combined with phenomena related to electrochemical events initiated by the shattering of the water. We postulated that perhaps free electrons flowing to ground accounted for the electro-chemical reaction. When this process was enhanced by the addition of electrolytes we concluded that electrolysis had to be the mechanism behind which oxy-hydrogen was being produced. Still, the rate and amount of gas and energy produced were inconsistent with the short time frames. Something else was going on. When we began to investigate the literature relating to cavitation in liquids and combined these observations with knowledge of the fluid dynamics of our impact system a totally different picture began to emerge. What is described next is a compilation of established theory and science regarding cavitation applied to the molecular dynamics of the Cavitation Energy system. In order to calculate the cavitation energy the impact pressure on the water nano-clusters must be estimated. This nano-cluster is the cavitation micro bubble coming from the injector nozzle. Cavitation occurs within the orifice of the fuel injector nozzle when the local flow pressure drops below the vapor pressure of the liquid. These cavitation bubbles are ejected from the nozzle at supersonic velocity into the impact chamber. When they collide with the impact surface they are crushed from the pressure. The most frequently used approximations to the pressure developed in liquid/solid impact are based on one-dimensional elastic impact theory. According to this model, the generated pressures in the compressed region are of the order of water-hammer pressure. This pressure is proportional to the impact velocity and shock velocity with respect to the unaffected bulk liquid as well as the liquid density. In our system, for the velocities involved, this pressure can exceed 275 MegaPascals or 40,000 psi. Experiment has shown that the impact pressure is both a function of distance to the target and angle of incidence. If the target is too far from the injection source the cavitation bubbles dissipate before collision and little heating is observed. The angle of impact further influences the amount of heating. Investigation and theoretical analysis of the process of sono-luminescence whereby light pulses are emitted by collapsing cavitation bubbles revealed extreme conditions within the collapsing bubble cores: temperatures in excess of 30,000K (5 times hotter than the surface of the sun) and even higher temperatures (in the millions degrees K) have been suggested. Under the influence of acoustic waves permeating the liquid these gas microbubbles undergo cycles of periodic expansion followed by violent collapse. The bubble collapse can be so energetic that light is emitted. Sono-luminescence generally occurs at ambient pressures. In our system the rate of bubble collapse is vastly increased because the external pressures are far higher. In early tests of our system oxy-hydrogen explosions were observed (View video of explosions on Our Videos Page) when the system was operated with a 4% sodium chloride solution at 900 psi. The temperatures required to produce this amount of oxygen and hydrogen in such a short space of time could only be accounted for through cavitation induced heating as temperatures above 3000 degrees C are required to get 50% molecular separation in aqueous solutions. The amount of heat and resulting steam are controlled by varying the pulse rate and width of the injection as well as the injector manifold pressure. These parameters are set and maintained by the central control computer as described in the invention. As suggested by the above video multiple arrays of impact chambers can be ganged to produce combustion gases to supply a rotary expander turbine for the generation of electric power. These applications are described in several white papers contained on the website.